Recently on Instagram, Sarah asked me how I got into penpalling and if I had any information about this sort of thing on my blog. I had been writing a little post in my head for a while now, and her question prompted me to finally get it together. I have written to friends and family since I was little and have even had a couple of penpals (friends from summer camps and my friend Claudia in Germany), but only recently have I started writing regularly to people I've never met in person who live across the country and across the world. This past July, Jeff took a two-week trip to South Africa. Shortly after he left the country, I got strep throat. Shortly after that, each one of my kids took turns getting sick with a stomach bug. That meant that at least one of us was sick during that whole time period. What does this have to do with letter writing? Well, we were homebound for a good two weeks. We made basically NO plans outside of the house. Once my strep cleared up, I felt fine and was able to take care of the kids, who mostly wanted to watch cartoons and sleep. I stayed up late at night waiting for it to be morning in South Africa so I could talk to Jeff when he woke up. I used all of this downtime and late-night time to myself to catch up on a pretty large backlog of thank-you notes. It was a wonderful way to spend the time because I had so many that I needed to write and also because writing to people is a great way to feel connected and not lonely when you are homebound and your husband is on the other side of the world with limited cell phone reception and time to talk. I decided to start taking pictures of the mail I sent and posting them to Instagram because pretty mail pics are some of my favorite pics to look at. And then . . . a whole new world opened up for me. 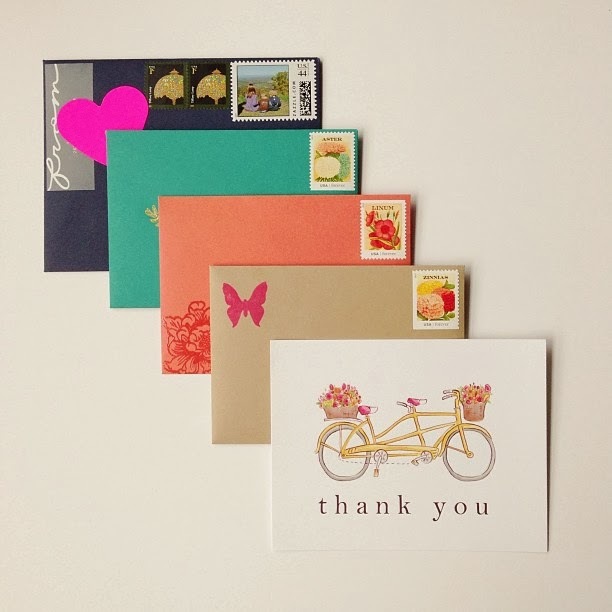 I already followed some of my favorite bloggers, but I started meeting other snail mail and paper enthusiasts (bloggers and non-bloggers alike) through hashtags like #sendmoremail, #showandmail, #snailmail, and #stationery (just to name a few). Now several of these new Instagram friends have become my penpals, which is so very cool to me. And even those that are not officially my penpals, I consider kindred spirits and online friends. And I owe all of this to a couple weeks of downtime, a long list of thank-yous, and Instagram (I love Instagram). Write a letter to someone you know, preferably your grandma. I got started in penpalling just by writing the letters I already needed to write. Start working on yours, and I'll be back with more soon! 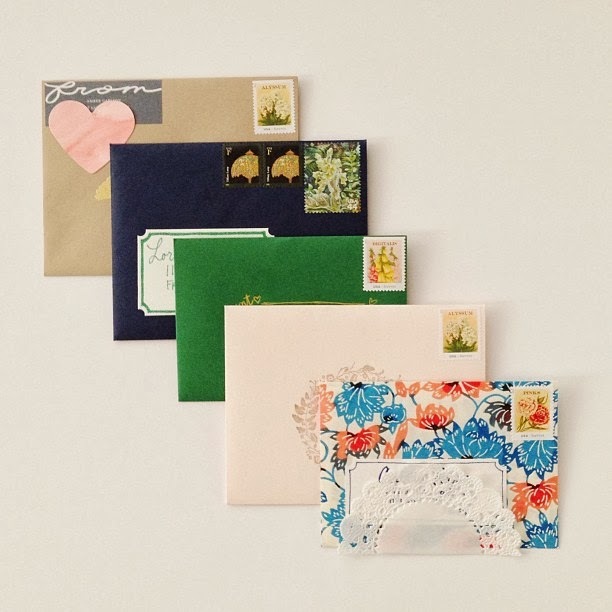 P. S. For some visual inspiration in the meantime, search the Instagram hashtags #sendmoremail, #snailmail, #stationery, and #showandmail. And you can see all my mail-related pics (and more) on my account here. P. P. S. Remember, the best inspiration comes from actually writing--so get out your pen and paper and write! Thank you for this post Amber! I am still so interested in this topic. I think it brings out the little girl in me when we used to get so excited to receive mail. As an adult, getting mail isn't as fun anymore. But making it pretty & writing to friends/penpals is a way to bring back the fun! Thank you for sharing! I'm definitely going to get started on writing my own letters! :) Looking forward to the next post! I couldn't agree more, "If you want to get mail, you need to send mail!". One of the best things about living in Japan is being able to 'write home' I've written more than I've skyped. Being so busy and at times lonely (alone in anew country as well as living alone) writing has been a great creative outlet. I love Instagram and am grateful for the people I have met through it and the inspiration I have found. Aww *blushes* right back at ya! Hi, Sulieen! I'm so glad you enjoyed the post. I got the label stamp from Paper Pastries--it's in her shop. I love it! Sometimes I stamp directly on the envelope and sometimes I stamp on label paper and cut it out to make an adhesive label. It's a great stamp--good quality and so fun to use! It's so nice to hear from you, Julie! I'm definitely in love. :) I'll have to list the LEP as a source when I write the rest of my penpal posts! Enjoyed the review on the LWA! Yay! That's awesome. And if you're looking for new penpals, you could also try my other blog - Penpal of the Week! I read your second post today... And I don't have an Instagram account, I'm afraid I'd be too addicted and spend way too much time on that website, but it's a good idea to look for penpals there! Yes, it's very easy to spend too much time on IG! I try to keep it in check, but it can definitely be addicting. It's been a great way to meet people, though! Can't wait to check out Penpal of the Week! I look forward to reading more about what you are doing. You're super creative! Such a good post - loved reading how you got started! 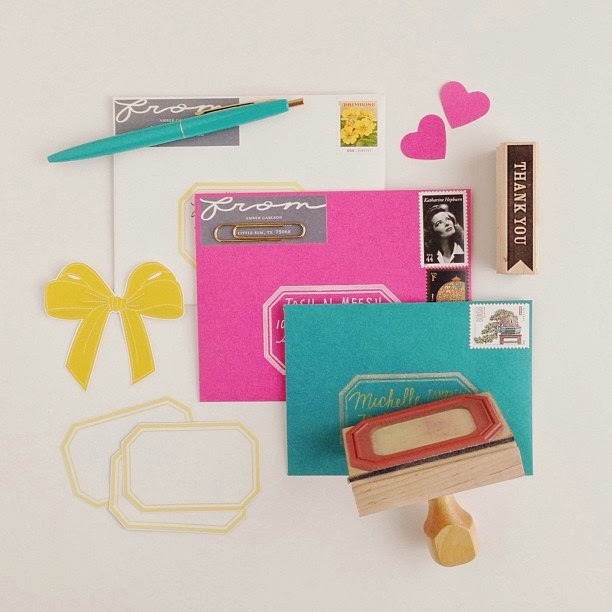 I have loved snail mail for as long as I can remember and I love seeing how other snail mailers do it. Your IG is one of my favorites! So glad to have you met you through it! I send letters for as long as i remember and i feel good to know a lot of people are doing this thanks to instagram ! Thank you so much! So kind of you to say. And I am so glad as well that people are sharing their letters on Instagram. Lots of inspiration out there! Hi, Merissa! Thank you--that means a lot, as I am a big fan of your beautiful blog. 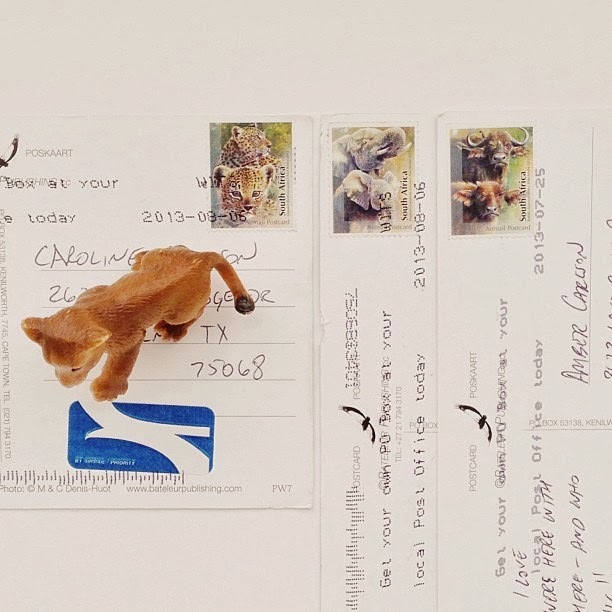 It's been a fun creative endeavor using Instagram to document the mail I send and receive. Would definitely love to see you on there more often. Your photographs are gorgeous, and I love seeing glimpses of Hawaii! I'm thinking about having a penpal and write a snail mail.. But I don't know how to start, but writing to family or friends is just a no no, because they don't do that anymore, we usually just text, email or phone.